Genesys is a tool that provides its users with improved call management, enhanced call routing capabilities to the right resources, and faster resolution of calls. Built with the customer’s satisfaction in mind, Genesys delivers seamless and consistent contact management solutions that enable them to engage customers across their journeys via multiple channels. The patented Customer Experience Platform ensures that clients get to interact with their customers on many touchpoints, allowing them to effortlessly deliver unparalleled customer support anytime. Design and manage customer experience and journey right from the get go to achieve desired results. Orchestrate the steps before, during, and after every customer interaction. Smooth and seamless transitions across multiple touchpoints and interactions. Gather insights from successful and unsuccessful customer journeys and analyze data from third-party applications to derive to thorough and detailed assessment. Become more proactive in engaging customers to remain consistent in providing positive and seamless customer experience. It is essential to keep in mind that almost no app in the Call Center Software category is going to be an ideal solution able to match all the needs of all business types, sizes and industries. It may be a good idea to read a few Genesys reviews first as some software may dominate only in a very narrow group of applications or be prepared with a very specific industry in mind. Others might function with a goal of being easy and intuitive and consequently lack complicated functionalities welcomed by more experienced users. You can also come across services that focus on a wide group of customers and give you a rich feature set, however that frequently comes at a more significant price of such a software. Be certain that you're aware of your requirements so that you choose a service that has specifically the features you look for. How Much Does Genesys Cost? Pricing available by quote only. Contact Genesys directly for more pricing details. We realize that when you make a decision to buy Customer Support Software it’s important not only to see how experts evaluate it in their reviews, but also to find out if the real people and companies that buy it are actually satisfied with the product. That’s why we’ve created our behavior-based Customer Satisfaction Algorithm™ that gathers customer reviews, comments and Genesys reviews across a wide range of social media sites. The data is then presented in an easy to digest form showing how many people had positive and negative experience with Genesys. With that information at hand you should be equipped to make an informed buying decision that you won’t regret. A true partner that concentrates on end customers CX and business! A versatile product that should work in just about any company. A platform without above-average customer experience. A game changer in the market. What are Genesys pricing details? What integrations are available for Genesys? Pros: Genesys offers high end solutions as well as business consultancy that prints awesome experience for customers and excellent ROI. It's an expert when it comes to engaging customers in all channels. Gensys is the master in organizing customer journey with proactive solutions. Cons: Most of its features in terms of integration with other solutions makes it a bit difficut to maintain a user-friendly and unified interface. But still, Geneysis offered a worthwhile one. Pros: Their portfolio products offer solutions for almost every kind of customer interaction today. Their solutions is a lot more transparenet and offers every business user the advantages with its endless possibilities. Cons: Their license/price model is traditional and it makes it challenging to compare it against some of today's products. They make it easier to seek out contacts or cues from within the systems. An intellectual tool for everyone. I love their intelligent routing. It's now possible to draw up a call flow that you can customize, integrate, and verify. 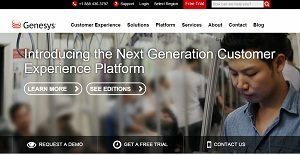 Genesys makes it a lot easier to customize your contact center for an enhanced CX. If you need more information about Genesys or you simply have a question let us know what you need and we’ll forward your request directly to the vendor.